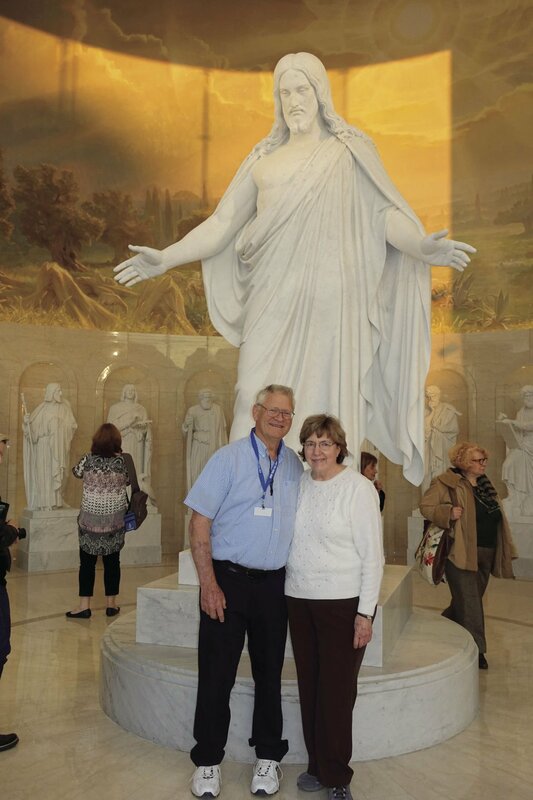 Cliff Kerr, right, and wife Ann Kerr, left, of Lodi, stand in front of a marble statue of Jesus at a Church of Jesus Christ of Latter-day Saints temple in Rome in late February. The entrance to a Church of Jesus Christ of Latter-day Saints temple in Rome that features a design from Michelangelo. A 400-year-old olive tree at a Church of Jesus Christ of Latter-day Saints temple in Rome. The Church of Jesus Christ of Latter-day Saints temple in Rome. A curved stained glass window in the visitor center of The Church of Jesus Christ of Latter-day Saints temple in Rome. While Ann Kerr and her husband Cliff Kerr have been members of The Church of Jesus Christ of Latter-day Saints for years, their faith took them all the way to Italy during the last two weeks of February to witness the dedication of a new LDS temple. “We started in Rome,” Ann said. After spending time in Rome, where the temple was dedicated, the couple traveled to Florence, Venice and Milan. “We left from Milan,” Cliff said. The temple, which Ann said took 11 years to complete, visitor center and piazza — similar to a town square — around which the two buildings were constructed all feature motifs inspired by the Italian sculptor Michelangelo. “When the mayor of Rome came to look at that, he recognized it and he expressed to our people there that he was so happy that we chose to use Michelangelo’s designs in the temple,” Ann said. The Kerrs also toured the marble quarry that Ann said Michelangelo used when he made Statue of David. That same marble was used to create a statue of Jesus and his 12 apostles in the temple’s visitor center, an exact copy of a statue in Copenhagen, Denmark. The visitor center also features a large stained glass wall with a curved shape that Ann believed made it that much more difficult to create. Although they enjoyed every minute of their two-week journey through most of Italy, the Kerrs agreed that visiting the temple was the highlight of their trip. “We saw this quote ‘the whole country of Italy is a museum,’ and that is so true,” Ann said. Ann and Cliff Kerr will show a PowerPoint presentation of their trip, open to the public, at 7 p.m. Sunday at The Church of Jesus Christ of Latter-day Saints, 1510 W. Century Blvd., Lodi.